What is sustainable agriculture? As we define it, environmentally and socially responsible grape growing. Tending to our estate vineyards has transformed Williams Selyem from buyers of high-end grapes into stewards of the land. As with the development of our Litton Estate Vineyard, with the exception of removing a few rocks, vineyards were planted around hundred year-old oak trees. Special care was taken to not disturb, but to maintain natural wildlife corridors and habitat. These practices not only help us to be more responsible land owners, but they allow us to produce exceptional quality grapes. This 35-acre vineyard located adjacent to the Russian River in Guerneville was an apple orchard owned and farmed by Roscoe Drake for many decades. In 1999, William Selyem developed the site as a vineyard. Cover crops are used to protect soil and the vineyard manager works with adjacent residential neighbors to define sustainable practices acceptable to everyone. 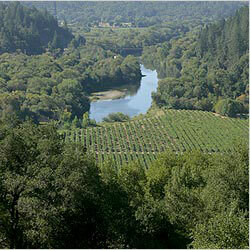 The property protects a wide swath of redwood and riparian forest along the river.